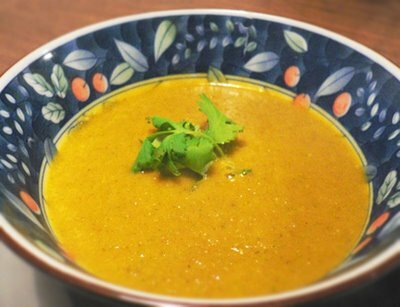 This recipe should be called "Deceptively Delicious Soup" because looking at the recipe, and looking at the finished soup, it doesn't look like much -- but it is so incredibly flavourful! I took each spoonful with delight. What makes this so tasty is the combination of cilantro in spice form and as the fresh herb. For maximum flavour, use whole coriander seeds that you grind or crush just before using. This is from the terrific vegan cookbook Juice For Life, by the restaurant of the same name (I made some minor modifications). I was loving their salads and sauces and dragon bowls so much I went out and got the book! Heat the oil in a large soup pot and add the coriander, toasting for a minute until lightly browned and fragrant. Add the onions and cook 5 minutes. Add the garlic and marjoram and cook a minute longer, then add the carrots and sweet potato. Saute for a minute then pour in the vegetable stock (I used 1 vegetable bouillon cube), bringing to a boil. Let simmer until the carrots and sweet potato are soft, about 20 minutes. Add the chopped fresh cilantro, sea salt and optional cayenne pepper to taste, and puree until silky smooth, either by using a hand blender in the pot or transfering to a blender. Serve garnished with a sprig of cilantro. Serves 4. I love the Juice for Life cookbook and really miss having a rice bowl for lunch nearly every day from the Queen Street location! It's one of the many things I miss about Toronto. There's a real lack of healthy fast food options out here in Edmonton. Sounds like the ayurvedic approach is really clicking for you frannie, it's inspiring. Miss you tonnes. Really tasty soup. I made this for lunch today with a lentil walnut salad. I feel warmed now (which is good because my furnace is on the fritz and its freezing in the house. I was cold and sniffly and this soup is just what I needed. Fran is not exaggerating... it's fantastic!! Really delicious soup! I was shocked how flavorful it is!